It’s Day Two of my week-long celebration of eggs but, it’s also Super Bowl Sunday. So, here’s the dilemma I faced: how do you fit the wholesome, goodfoodness of eggs onto a menu that consists of the greasy, fatty jumble of nachos, chicken wings, corn dogs, meat-lovers pizza and beer? And, no, egg batter doesn’t count. It’s too easy. Pickled eggs are passé, devilled eggs are too dainty and poached would be laughed out of the man cave. There had to be a way to give eggs their proper place among the heart-stopping, acid-reflux-inducing, mouth-watering array of North American sports bar cuisine (if I can use that word). For the answer, I turned to my Scottish cousins, who seem the most able to turn every dietary virtue into a culinary vice (anybody for boiled-for-an-hour veg?). The Scots can even make bad food worse. Witness the deep-fried Mars bar. But, perhaps I’m being too harsh. I’m not even sure that Scotch eggs are from Scotland. They could be just another ploy by the sourpuss English to give the Scots a bad name. After all, they’re still jealous because it was the Scots King James who wrote their Bible. Anyway, I digress. 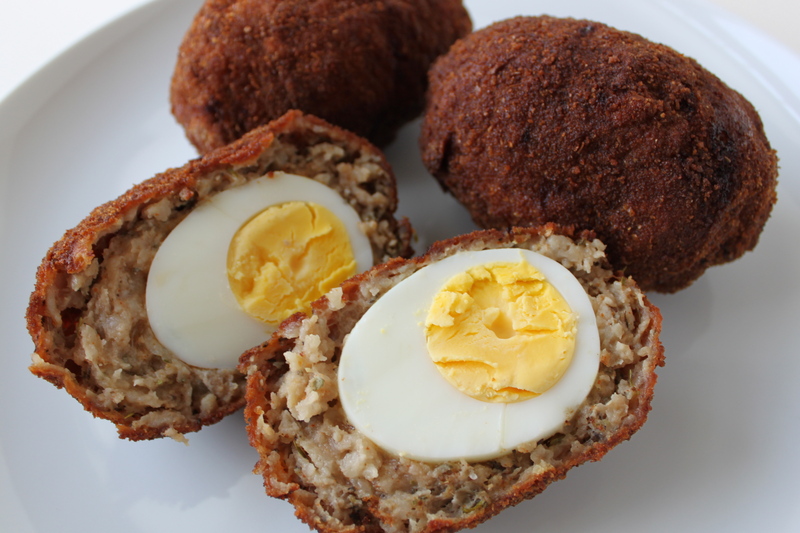 Wherever they came from, what we call Scotch eggs are perfect sports-bar food and have nothing to be ashamed of next to a plate of deep-fried cheese sticks and a bottle of Bud – they’re even shaped like footballs. Anything wrapped in sausage and then breaded and deep-fried is sin food, even if you are rooting for the Saints. This recipe is adapted from one in Gourmet magazine from March 1991. I made my version with simple country sausage, flavoured with sage and thyme (with a little heat from cayenne), but you could make this with virtually any kind of sausage. Mix the sage, thyme, cayenne and black pepper with the sausage and form into four flat patties. Cover each peeled, hard-boiled egg with sausage meat and shape with your fingers until sealed. One at a time, cover with flour and shake off excess. Dip in beaten egg and, again, shake off excess. Finally, cover in bread crumbs and deep fry two at a time for 10 minutes. Drain on paper towel. 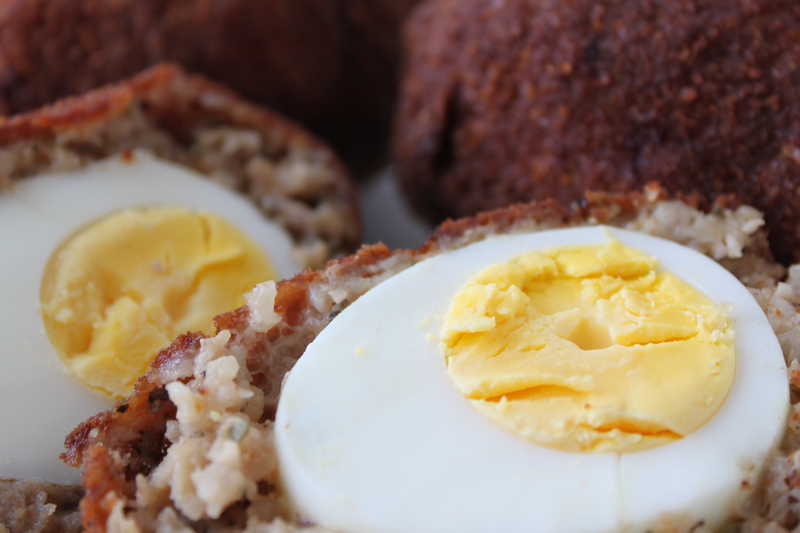 Scotch eggs can be reheated in a warm oven. This entry was posted in Appetizers, Eggs, Snacks. Bookmark the permalink.